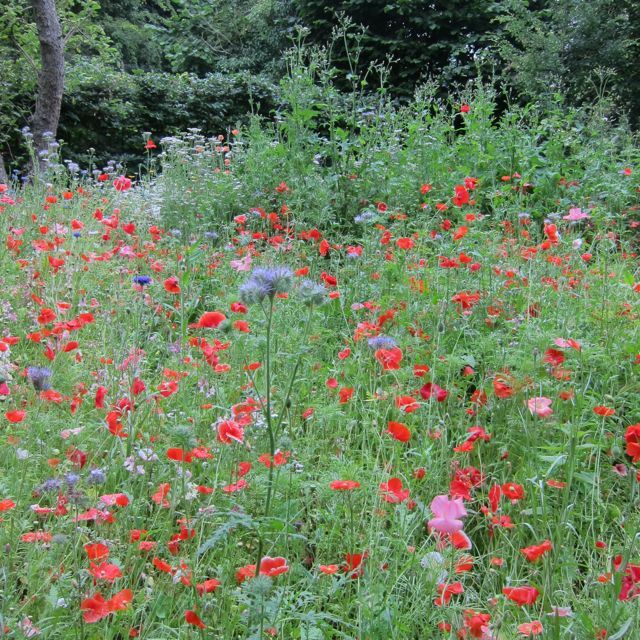 The trial of the Wildflower Meadow begins with the evidence from the Counsel for the Defence, please see photographs below. 'Well, m'lud and jury, you have seen the photographs - the wildflower meadow is a valuable asset to the garden both aesthetically and practically. It contains a rich diversity of flowers which give colour from June to the first frosts. The colour palette shifts subtly through the season, starting off with pastels, in hues of mainly pink and blue. These delicate colours deepen and become more rich as the season advances, moving through to rich reds and vibrant oranges. 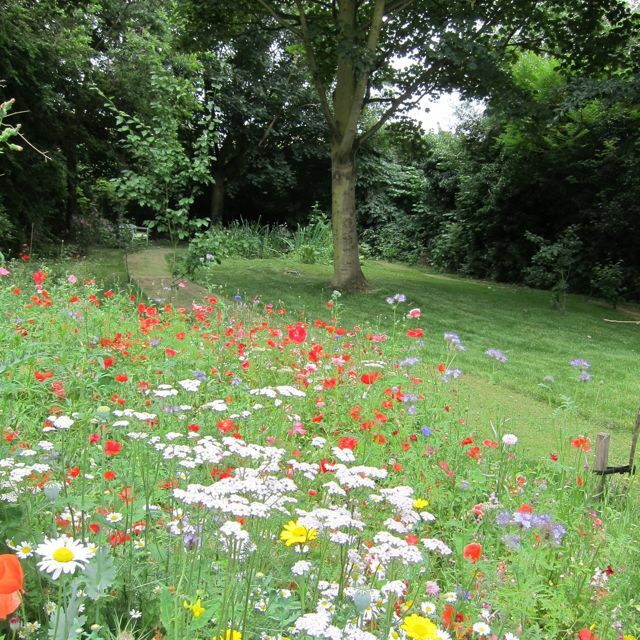 The meadow enhances the garden for about 4 months and provides changing interest. However, the meadow is not just a thing of beauty but has great ecological value, as the diversity of flowers encourages insects, bees and butterflies, which in turn benefits the entire food chain. If this area was not planted as a wildflower meadow, then it would be put to lawn, which would severely diminish the opportunities for wildlife. The jury would be wise to listen. if they have chance, to the noise emanating from the wild flower patch. They would hear lots of buzzing and see heavy insect activity. If they were then to turn their attention to the lawn alone, I am sure that they would be struck by the silence and lack of any activity. There is a great diversity of plants in this area, poppies, corncockle, Ladies Bedstraw, ragged Robin and Cosmos, to name but a few. All these are single flowers which allow bees to access them with ease. The flowers are followed by seeds which are enjoyed by many species of birds. 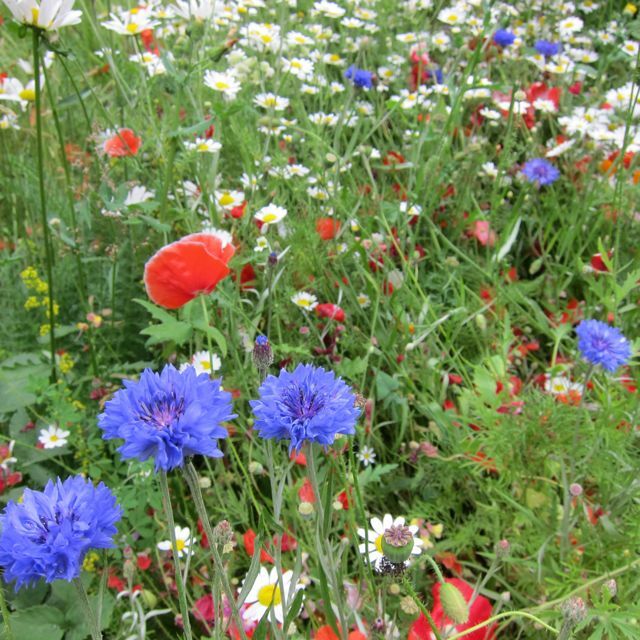 In summary, the wild flower patch provides a micro - environment which is rich in wildlife , which is sustainable (as the seeds are collected and sown ) and also beautiful. In the wider environment, habitats are shrinking for wildlife, hedgerows and grass verges, meadowland and wetlands are disappearing. Areas of wildflowers are a way of counteracting this, and providing a habitat for a diversity of species. It is the view of the Counsel for the Defence that the wildflower meadow should remain unchanged. 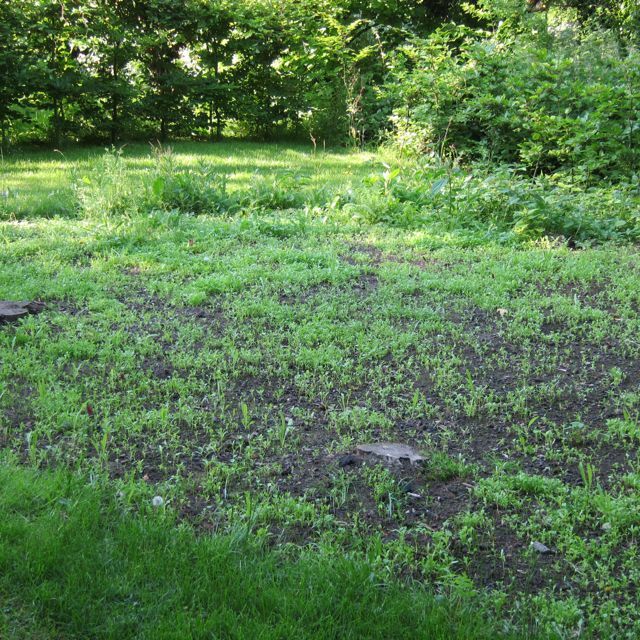 M'lud, and members of the jury, I would like to draw the attention of the jury to the above photographs, and to point out how unattractive the area is, for the majority of the growing season. I would agree with my learned collague, that the meadow is attractive at its peak. But it peaks for only about three weeks. In the early stages of growth it is not particularly attractive, and, indeed, only becomes so once flowering begins. As stated before, there is an optimum period of three weeks when the flowers are blooming when then they are standing upright. The jury will note from the later photos how the area is beaten down and unattractive. Flowers go to seed and then die off, leaving dying, brown vegatation, and little colour. I am assured that this happens every year without fail. 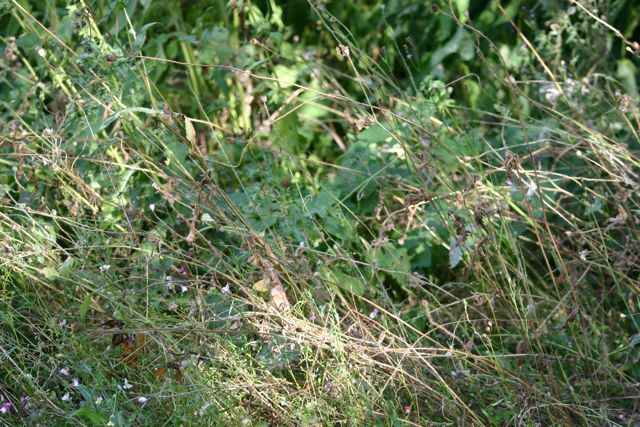 It was initially thought that the meadow appeared beaten down due to high winds, or even neighbouring dogs, but this has not proved to be the case. This is just the pattern of growth. The high cost of this area should also be considered, as I am reliably informed it costs £60 a year to buy the wild flower seed, and that planting it is quite labour intensive. This money could be spent elsewhere more effectively. As for wildlife, I would suggest that there are more than enough opportunities for wildlife to prosper in the garden. 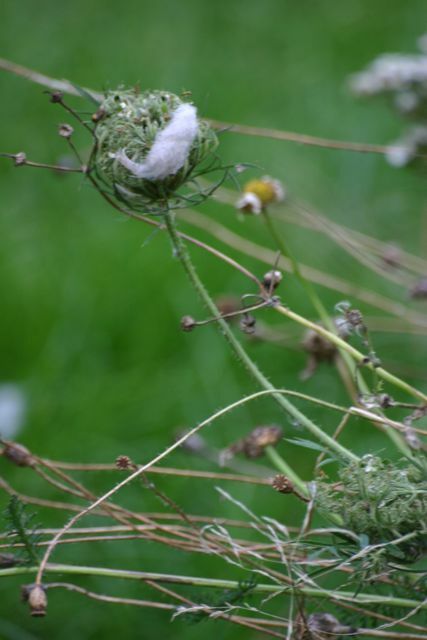 There are many single flowers planted elsewhere, and areas of long grass, nettles, woodpiles and a wildlife pond. Birds are fed regularly with a variety of foodstuff. There are plenty of areas to encourage insects birds and mammals. I propose that this area be returned to lawn forthwith, which would be cheaper, visually more appealing and cheaper. 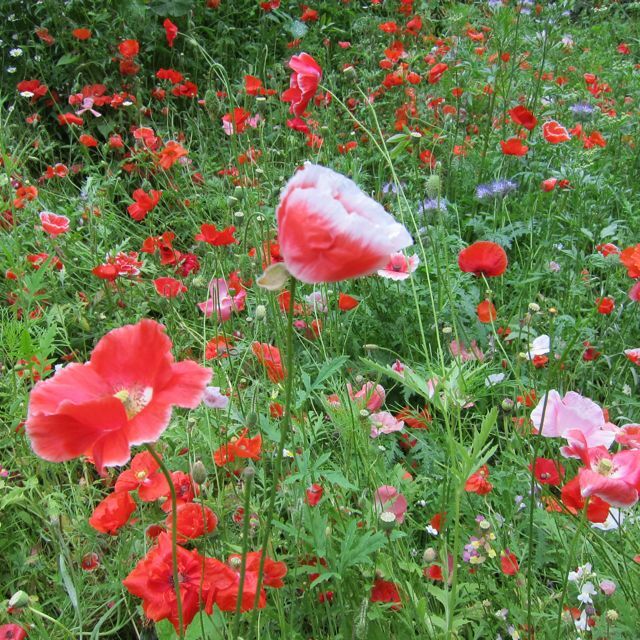 Learned counsel and jury, please consider the fate of the wildflower meadow, before you reach your verdict. I have a small suggestion which may be of help. Could the area not be planted with perennial wildflowers, rather than annuals ? This would, over time, substantially reduce the cost and the labour, and maay result in sturdier plants, more able to remain upright ? This would improve the aesthetics of this area, whic, in my view, has a positive benefit to wildlife. Come on jury !! 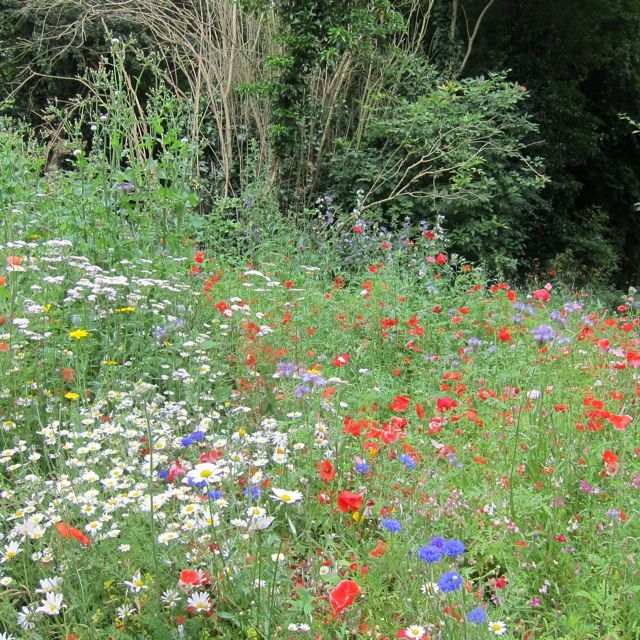 Would you don the black cap, or give the Wildflower meadow a reprieve ??? The jury will take your plea into account ! Erm, sadly the jury definitely do lie in a hammock whenever they can, but the tipple of choice is wine, not gin ! doesn't look good ! Mine is more of a patch and less of a meadow really ! Yours sounds as if it will be lovely - good job, on getting the meadow ! Jane loved your photos at top of blog of your wildflowers. It really is so sad to see when the stop blooming. No lawn!!! I have too much lawn and would love to have your meadow. Besides, the jury might have been paid off by a lawn fertilizer company. I wouldn't trust them! Lol ! As the jury are already known for lolling in hammocks drinking red wine, there is every chance they would be bought off by ANYONE ! I am not going to offer an opinion on the fate of your wildflower meadow.I am sitting on the fence, preferably a fence with a view of the meadow in full bloom. Hi Lyn. ha ha ha ! I may join you sitting on that fence ! 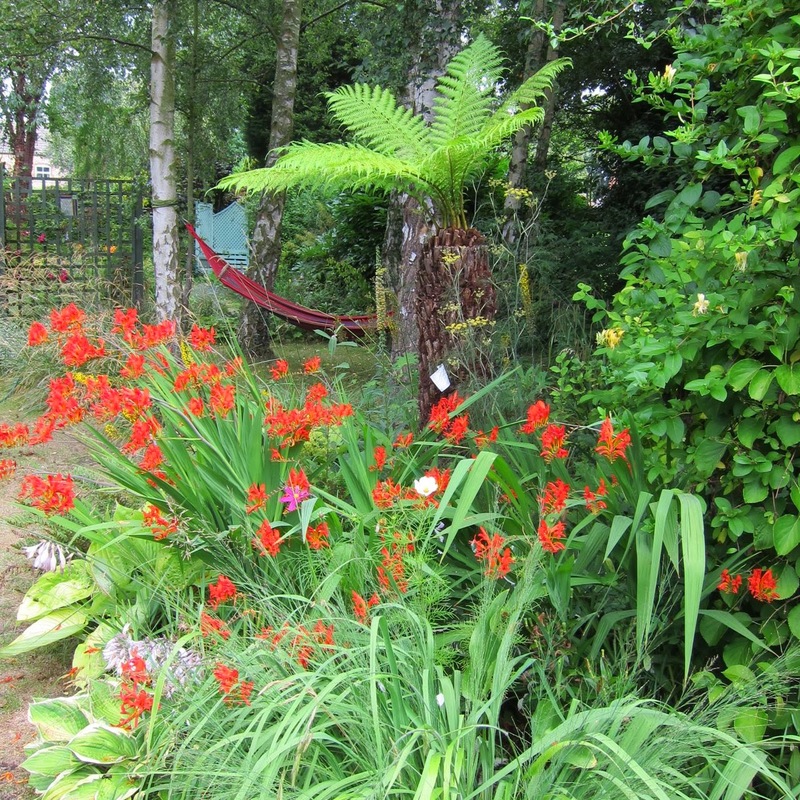 If you replant with perennials how is that different from a (cough) flower border wot most gardens have? You don't think we might all grow tired of the Teletubby look of 'annual meadows' soon? 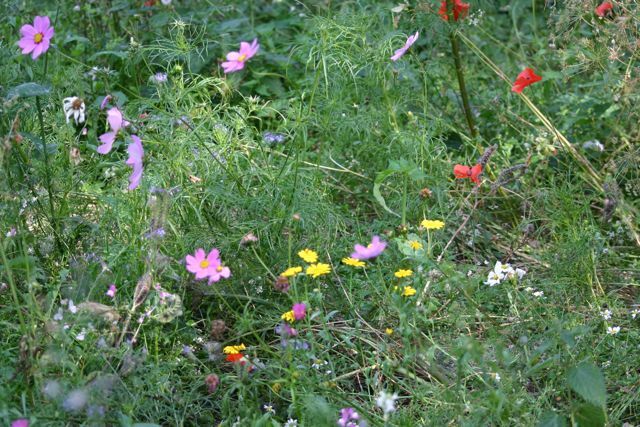 They're not 'wild flower' especially and you are quite right about ecological virtues of the whole garden..
Hi Anne, thankyou for your comments. 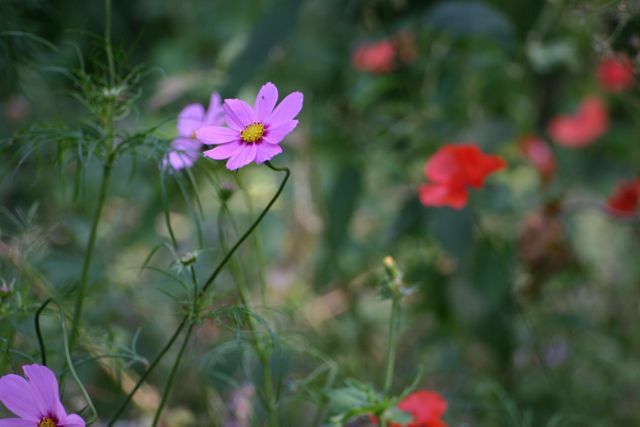 I would plant a mix of perennial wildflowers rather than the annuals I am currently growing. In the rest of the garden I really work hard to colour for as long as season as possible , right through from March to late autumn. The wildflower patch has a very short 'life' compared to that ! Hi Jane, thanks for the visit to my blog. I love the meadow, but I would probably plant perennials. depends how much you have to look at it during the 'ugly' phases and how desperate you are for space to plant other things you love. Tis a glorious thing in bloom, however and its benefits would be enough for me to grant it at least a temporary reprieve. Save seed and save yourself the prosecution's £60.00? Thanks Tucksho p Gardener , I let the plants selfseed, so there is a saving on the total cost of seed. I don't really have to look at it unless I want to, as it is right at the bottom of the garden, and I don't need the space ! I have noted your 'temporary reprieve' comment, and will inform the jury !! Good call ! Oh Jane, your meadow is so beautiful. I am green with envy. 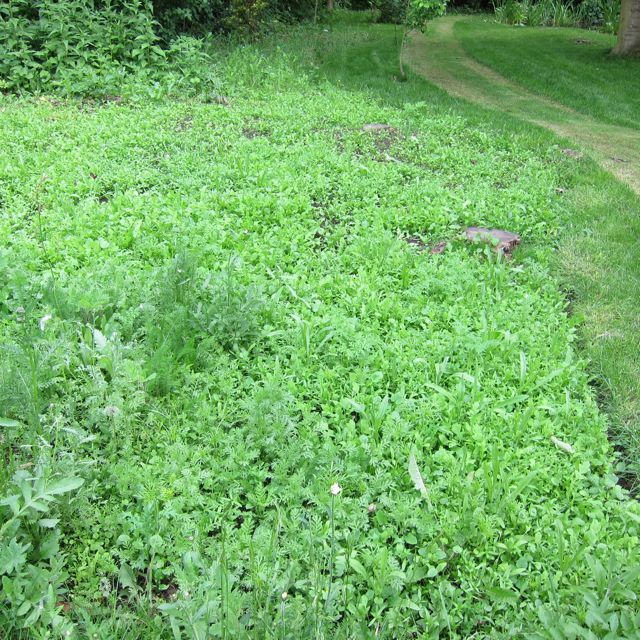 In fact I'm nearly as green as my own weed strewn mess of a wildflower meadow that wasn't. Here's my sorry tale if you want to see what I mean.